We are a full-service junk removal company, but what we really do is help home and business owners regain space without the stress of hauling items themselves, or having to know where and how to dispose of unwanted items and debris. We look after all the details related to removing, recycling and disposing of your unwanted items. Ottawa ON Dumpster Rental & Portable Toilet Rental Call 888-407-0181 or visit <a rel="nofollow" target="_blank" href="http://www.AWWaste.ca">http://www.AWWaste.ca</a> today & see why we're Canada's Best Family Owned Waste Company! Lowest Prices & Superior, Friendly Service are what set us apart from the rest! Whether you’re clearing your yard of debris or cleaning out your garage, renting a dumpster is a crucial component to any major clean-up. Dumpster rental companies in Ottawa, ON deliver a waste container right to your home and then pick it up when your project is complete, taking out all the hassle of getting rid of your debris. Due to the fact that Ottawa, ON rental dumpsters come in a variety of sizes, determine the size of the project and the type of materials you’ll be throwing out before finding an Ottawa dumpster rental service on Houzz. 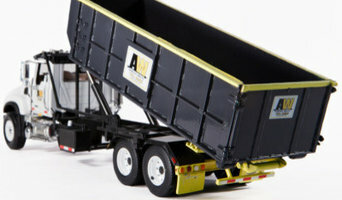 When it comes to the cost of a dumpster rental in Ottawa, ON, get some preliminary information and quotes. The final job cost to rent a roll-off dumpster is based on a variety of factors, including dumpster size, the type and weight of debris to be removed, how long you’ll need the dumpster for, and general availability. Keep in mind that materials that pose environmental or fire hazards are usually prohibited and fall under the realm of environmental clean-up. This includes items such as batteries, fuel, oil, tires and toxic waste, among others; additionally, abnormally large items are usually banned as they may exceed the weight limit of the dumpster.